Manas Chakravarty. Between 2009 and 2013, India’s HDI increased from 0.512 to 0.586. That’s a jump of 14.5%. Photo: Charlotte Anderson. In the four years from 2013 to 2017, India’s score on the United Nations Development Programme’s (UNDP’s) Human Development Index (HDI) went up from 0.586 to 0.640. That’s an increase of 9.2%. How does that compare with the performance of last four years of the United Progressive Alliance (UPA) government? Between 2009 and 2013, India’s HDI increased from 0.512 to 0.586. That’s a jump of 14.5%. At first glance, therefore, the human development indicators did better between 2009 and 2013, compared to 2013-17. True, India’s rank on the HDI went down between 2009 and 2013, while it went up between 2013 and 2017, but that’s due to the performance of other countries. At the same time, it’s also true that the higher we are on the HDI, the lower the rate of improvement. Indeed, there has been improvement on many yardsticks of human development in the last four years, as Chart 1 shows. Life expectancy at birth has improved from 66.4 years in 2013 to 68.8 years. Maternity and infant mortality rates have come down. School attendance has gone up. Of course, the record on gender inequality is particularly egregious. As Chart 1 shows, per capita income for women is a bit more than a fifth of per capita income for men. Bangladesh, Bhutan, Nepal, Myanmar, all score higher on the gender inequality index than India. In fact, the gender development index for India is worse than that for sub-Saharan Africa. Inequality too has been going up, as the rise in the quintile ratio, which is the ratio of the total income received by the 20% of the population with the highest income (= 1st or top quintile) to that income received by the 20% of the population with the lowest (= 5th or bottom quintile). The question is: why can’t India, which is the fastest growing large economy in the world, do more for human development? 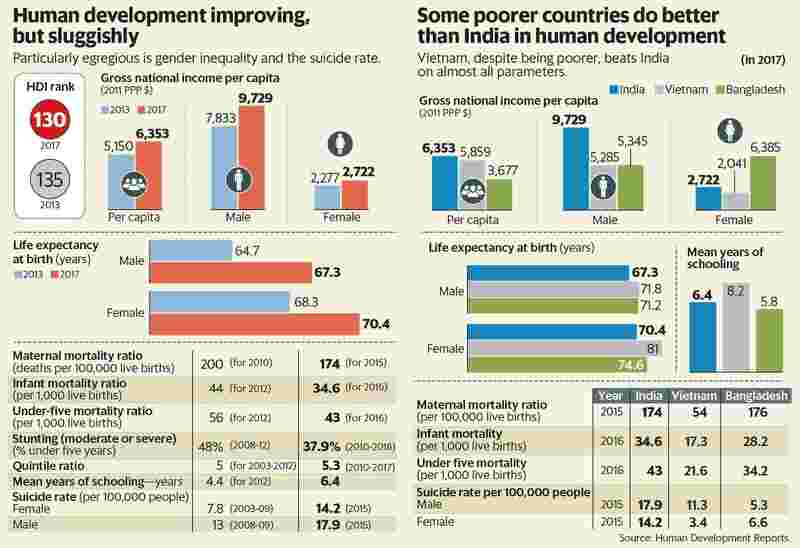 It is not because we are poor—countries like Vietnam and Bangladesh, which have lower per capita income than India, do much better on several human development indicators, as Chart 2 shows. India’s healthy life expectancy at birth is a mere 59.3 years, lower than that of Cambodia, Nepal and Rwanda. Vulnerable employment in India, or the percentage of employed people engaged as unpaid family workers and own account workers (self-employed) is 77.5% for India, compared to 57.5% for Bangladesh. Vietnam, in particular, does better than India on almost all parameters. Could it be that a one-party communist state does more for human development than a democracy such as India?